'll start with a terse and formal curriculum vitae. My grandfather Moses Averbach was born December 30, 1906 in Moscow. He was the son of a prosperous Jewish merchant, the merchant of the first Guild ("untitled" to the Jews before the revolution were not allowed to live outside the pale of settlement"). His father Naum Izrailevich Auerbach, died March 8, 1916, 44 years old. Mother, Khan-DIN israelevna (by passport Anna Davidovna), nee Blumberg, lived until 1968. On her grave, and written and Khan-DIN israelevna, and Anna Davidovna. She was the daughter tsadeka (Jewish scribes) from Kovno, i.e. Kaunas. She had many brothers and sisters (about thirteen), but the majority remained in Lithuania, and when Soviet troops in 1940 occupied the Baltic States, none of each other to find no time. Known only the fate of the two brothers Anna Davidovna trapped in Russia: Abram was shot in 1937, and Boris "lucky" - he died a natural death in the sixties. And Moses Naumovich had two sisters: Cecilia Naumovna (she had not seen in 1972 because of this, hit by a car) and Eugene Naumovna (she grandfather survived for a few years). Grandfather... I always called "uncle Monya. Why "uncle"? The fact that Moses Naumovich was the second husband of my grandmother, Elena Alexandrovna Kavelmaher (nee kolobashkin) and, accordingly, no father and stepfather, my father Wolfgang volfgangovicha Kavelmahera. So in early childhood and complicated - not "grandfather"and "uncle". It turns out that, formally, all the ancestors and relatives of Moses Naumovich I can not call her. But it so happened that I was with Moses Naumovich favorite grandson (his own grandson, my age ten years, he had seen once in life and for some reason did not show willingness to continue communication). And the grandfather, an outstanding man with a strong will and an iron character, which had a tremendous spiritual and psychological effect on my grandmother Elena Alexandrovna, and my father had a lot to do for me. And speaking of relatives and ancestors, I remember this episode: fourteen or fifteen (i.e. approximately 1978) I was concerned with the question of their origin and took all the grandmothers and grandfathers "interview" about the person of your ancestors and relatives they remember who was who and what they were doing... I "interviewed" grandmother Elena Alexandrovna, and Moses Naumovich was not going: like his ancestors - not mine... And he was hurt and he insisted that I wrote about him. "All so" I feel like a family-related Averbach not less (perhaps even more)than vested. Moses Naumovich - my grandfather, and another I had never perceived, while in my childhood, I remember, not once explained the difference between the "grandfather wolf" (Wolfgang Alfredovich Kavelmaher, my mother's grandfather on his father's side, whom I had seen a couple of times in my life) and "uncle Monya. But back to the story of Moses Naumovich. He graduated from a certain Commercial Academy, before the revolution are the elite of merchant standards. Excellent education grandfather received and further, ending superprestizhny at the time of the "Institute of national economy named after Plekhanov. By profession he was a mining engineer and in 1933-1934 built the Moscow metro. 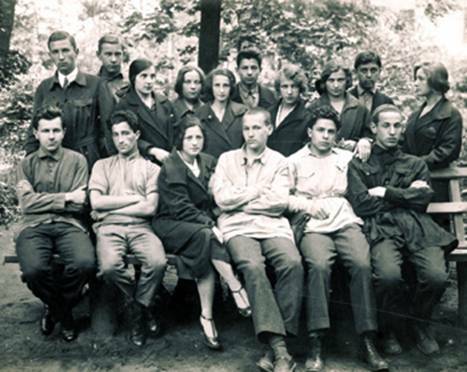 Student group Moses Naumovich. He sits second on the left. At this time the graduates of the student group, where he studied Moses Naumovich, decided to create a kind of "social insurance scheme for mutual assistance to needy classmates. Soon some "well-wisher" hit the NKVD, the money collected for the needs of the Trotskyist movement. The first term of his grandfather, despite liter krtd "("counter-revolutionary Trotskyist activities, much worse than MRC), was not at all time to three years of exile in Tula, where he worked in a construction office. In those days every engineer had a very broad specialization. Moses Averbach (front row, left) on tour in Yasnaya Polyana. The middle of the 1930-ies (Tula link). He married for the first time back in Moscow, and "Tula" times his son Yury was born. Chat with his son Moses Naumovich almost no time is over a link, and he returned to Moscow, where he was immediately arrested. For the former exiles it happens automatically - the yard was in 1937. Moses Naumovich sat under investigation for more than two years, he was beaten, broken finger, which merged the curve (bus unprofessional laid in the chamber). When I was a child my grandfather told it, I remember, was terrified, and this slightly crooked finger at me still before my eyes. Santa got eight years, and he visited a few lumbering camps Komi ASSR, in 1943 came to Vorkuta, that saved him. The country was in desperate need of coal, and mining engineer could not be used as intended. Vorkuta... I've never been there (my father in the late 1990s were going to go there, but never met). But I still have a feeling that I know this city very well. Anyway, town Ry'dnik (accent for some reason on the first syllable) is the oldest city district. In 1930-1940-s, by the way, and the only one. From his early thirties and began the city of Vorkuta, received its name after the river, which was Mine. All the old vorkutintsy said: "I live on Vorkuta" - that is, as though not in the city, and on the river. The town is situated North of the Arctic circle and around the tundra, but we should not be perceived as smooth expanse of the plain. Vorkuta river flows in a deep depression between fairly high hills and houses "run down" to the river terraces. The centre of Vorkuta in the early sixties "crossed" the river, and now there is quite modern apartment buildings and village Mine is still the same as it was. According to information received in the mid-eighties, survived even the wooden two-storey house, where my grandmother lived with my father (grandmother in 1937 has been repressed for the first husband, a German Wolfgang Alfredovich Kavelmahera, "eternal exile and was forced to take and four year old son) and where after the marriage settled and Moses Naumovich. Now, of course, piles of mines moved far out of town and area disappeared from the eyes. At the same time the city was surrounded by all the camps, each shaft (acting was about twenty-five) was individual camp sites, and it turned out that the whole city was one big area. What is coal mines, drifts and slaughter everyone knows, but sees them more often as the type of underground tunnels. In fact, in the bottom is impossible to stand at full height, a narrow passage in the ground with incredibly stale air filled with coal dust. Now the miners at least work in masks and respirators, and then with the protection of labour was still "not very". Moreover, the cons - what them, enemies of the people, sorry? However, the spare had when the war was lost Donbass, and the Pechora coal basin is the sole supplier of coal, it is extremely necessary for the country. But the terrible winter of 1941-1942, yet no one is spared, food supplies were any, and the prisoners were dying masses. Outside the city were dug several trenches, and there was a sleigh pile of corpses. It became easier in 1943, when the Ural somehow earned evacuated industry and it needed coal. Here and supply has improved considerably, and there was an American "lend-lease" stew. 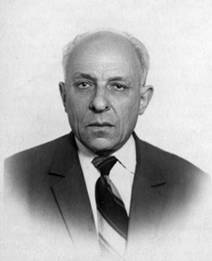 Moses Averbach was the chief of ventilation 40th mine almost immediately after the convoy to Vorkuta and in this post he worked until 1961 (i.e. after full rehabilitation of all "cases" in 1955-1956). Sounds smooth - "worked", but actually Naumovich Moses, when he expired, "tried" two times. But under the new investigation, and having regular periods, and then "eternal exile, he remained "beskonvoynyh chief ventilation shaft. From the commander of ventilation depended on hundreds of lives - and the miners, and staff, and armed guards from the NKVD-schnick also sometimes required to descend into the mine. Note that in 1961, after the release of his grandfather retired, his successor, was so incompetent that mine methane explosion, and killed several dozen people. Irreplaceable people, as we see, there were then, despite the famous words of comrade Stalin. How much Moses Naumovich saved I don't know. Personally, I remember five people, and hearsay - a few more. Among them was, for example, writer, hero of the civil war in Spain Alexey Eisner. And Professor Elicona of G. Leikin (later known "informal" analysis of the Soviet system) grandfather put "tabakotrusom" - make sure that the shaft was not carry tobacco. It was the responsibility of the head of ventilation - as well as anyone in the pit lit up and everything will explode? 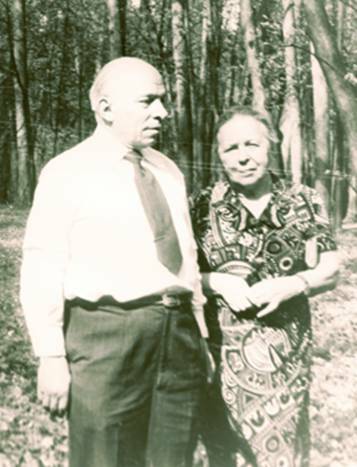 Immediately after the war Moses Naumovich met Elena Alexandrovna Kavelmaher, my grandmother, and soon married her. With his first wife he had divorced by mutual consent, whether it is from him in the late thirties "refused" unilaterally as of the convicted "enemy of the people" - I do not know. My grandmother also left her first husband in absolutely clear reason - she truly loved Moses Naumovich and retain this love until death. It is, as they say, "positive" grandfather became very seriously their responsibilities as head of his new family. My father was in school is bad enough, and besides, he was about thirteen years old - the so-called "transitional age". Moses Naumovich, despite the natural resistance of the child (who loves who has entered the apartment stepfather and not jealous of his mother? ), immediately took up his "discipline". In the end, my father received the excellent education, which can only be imagined at that time. Moses Naumovich, to her credit, this stupid "ill" during the Tula links and knew perfectly well. Moreover, he was not only a staunch anti-Stalinist, but anti-Leninists. However, not anti-Marxist. This position was most common among the prisoners, or who thought Lenin perverted the teachings of Marx, or Stalin - perverted the teachings of Lenin. Very few went further and raised his hand "to historical materialism, even in poslelagernoe time, and only in the zone - and even more so. Of course, so for ideological disputes among the camp inmates were many, but one they usually converge - in hatred of Stalin. Maybe meet crystal clear Communist soul, designed, "twenty years as a day, exchanging, take through camp faithful beloved leader, but I have not heard of such. But "loyalty to the party, despite the abuse of the cult of personality"in the Khrushchev era actively cultivated, and the bait, indeed, caught many former camp inmates. It looked like the "spravochno printing on rehabilitation." Moisey N. and Elena after rehabilitation in 1955-1956 he entered correctly - finalized in Vorkuta until retirement, during this time got itself two utility rooms in Moscow, then traded them for a small, one-bedroom apartment on Gagarin square, then the Kaluga Zastava. Slowly and with difficulty, but the government performed its duties. In Moscow Moses N. and Elena eventually moved only in 1961, but until then, still in Vorkuta, they have a full-employment period and, accordingly, great Northern allowance, then the maximum possible at the time pension. The house of Moses Naumovich and Elena Alexandrovna on the Kaluga Zastava was unique for many reasons. First, it was not a house, and a library. Books and magazines were everywhere, and I still do not understand how two small adjacent rooms housed as many printed materials. Even in a narrow corridor over the heads of passing hung bookshelves (thank God that none of them fell down and nobody was killed). In meticulous Moses Naumovich all books were copied by number of shelves, on which lay, and also conducted a separate notebook for accounting books, these friends to read. Secondly, in the house reigned perfect purity and grandeur. Moses Naumovich the morning, regardless of future plans, always wore a suit, tie and shoes. Maximum freedom, which he allowed himself is to take your coat off, hang of it... no, not in the closet, and back in his chair, and stay in the waistcoat. He would have to be sitting at the papers or something masters, but the "dress code" were the same, only in the heat of summer it could be a shirt with short sleeves. Accordingly, Elena Alexandrovna in life I grandfather never seen in a Bathrobe and Slippers. Third, Elena looked at Moses Naumovich with indescribable adoration (I must say that his grandfather is quite deserved). About their relationship says that my grandfather slept in the big bed in the bedroom, and my grandmother got out every night and put themselves... cot. Later, however, it bought a small couch. In short, feminism in the house and did not smell. Rather tyranny. Fourth, Elena was extremely gracious and hospitable hostess (one can only wonder how she spent nearly 20 years in Vorkuta link, it kept so smooth, quiet and friendly nature). The house shone delicious food - was near the supermarket "Sputnik", which in Soviet times decently supplied. There were so-called "orders", which provided the former Director of the Central Department store Lev Matveevich Portnov, but it is probably in the fifth. And fifth, was the company of former prisoners of Stalin's camps. Together, they meet once a year, on the fifth of March - the day of Stalin's death. Many of them have been saved Moses from slaughter Naumovich. They gathered a few dozen people, small apartment Moses Naumovich accommodate them could not, and they met at the George L. green and his wife Elena Alekseevna. George L. was the son of an American engineer who worked in Moscow in the twenties. Then last returned to the US, and the son in the USSR liked and he decided to spend more. Naturally, in 1937 he was offered "live" somewhat North of Moscow. He came to Vorkuta, was Moses Naumovich saved and there is married, also to prisoners. Now, Green was a big apartment in metro Airport, where all the 5 March and collected. Very often there was singing, Alexander Galich. Green all the inmates each year was given specific "gifts" - a piece of barbed wire, a cardboard wheelbarrow, then saw a birch logs, plastic soldier with a rifle, a lithographic illustration to "the Ballad Redingskoy jail"... So in an apartment on the Kaluga Zastava and there were two copies of all of this - Moses N. and Elena were on equal terms "camp" rights. However, despite the small size of the apartment, my grandfather and grandmother at the Kaluga Zastava also continuously used a considerable number of people - and on holidays and on weekdays. Their company was a party member with the pre-revolutionary experience Lev Matveevich Portnov. He sat down in 1937, but even under Stalin, was released, and the camps was Director of the Central Department store - by Soviet standards incredibly high post because of the possibility of distributing the "deficit". Having stayed, he managed to return almost on a former place of work - apparently worked some "trade mafia" connection. In my mind he was already retired, but in generalized deficit got to former prisoners and grocery orders, and tickets to good theater, and anything. Sixth, the grandmother was a professional typist (on Vorkuta it, despite its status as an exile, even the charge typewritten in admchasti one of the mines) and printed huge amounts of "Samizdat". Among its "clients" were historian Roy Medvedev, Professor Ilicon the Lakin (who wrote under the pseudonym "Zimin"), the famous author of "Kolyma tales" Varlam Shalamov, no less famous Vasily Grossman and many others (don't know printed if she Solzhenitsyn, but he typed it exactly). Seventh, grandfather Moses Naumovich continuously did anything, I never saw him rest. TV's home in principle was not, not to be distracted from work. For information quite enough Newspapers, strictly structured clippings which took several large folders. And for the very useful information was huge radiogram on which to listen "enemy voices". I remember that, seeing me in 1971, "for the first time in the first class", Elena said: "no one in the school do not say that listening to "bi-Bi-si" and "German wave", and if they ask, answer, that no". Eighth... No, this is not the eighth. The activities of Moses Naumovich Averbakh in the sixties and early seventies, deserves a separate conversation. First of all, he has to Vorkuta time wrote great autobiographical novel, which covers the period of Stalinist terror and called "To the glory of the Lord (Ad majorem Dei gloriam)" - such wording in the middle ages, the Inquisition was sent to the fire dissidents. The novel was 950 typewritten pages (something that my grandmother Elena Aleksandrovna all this repeatedly reprinted, can be considered a feat). With such a huge amount of all attempts to publish at least the first four parts of the novel during the Khrushchev "thaw" 1956-1964 years ran across polite refusals editions. However, these failures political situation also played a role - and Grossman, and Solzhenitsyn published selectively, then "thaw" ended, and the novel Moses Naumovich was frankly camp and the anti-Stalinist. My grandfather was a chance the publication of the novel in the West, but his grandfather somehow not used (as far as I understand, forward Roman abroad, he didn't even try, although the special problems it would not be). Maybe he was hoping to the last published book - at least partially - in the USSR. Maybe the publication of the novel abroad contrary to its principles. I do not know. And for the "Samizdat" such a huge volume - 950 pages - was too great. In the last years of his life in Vorkuta grandfather wrote some very good stories and novels. 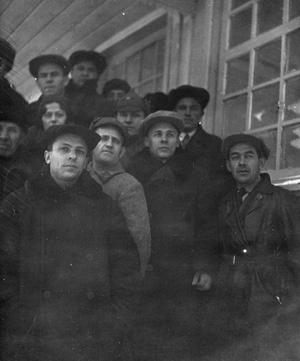 Some of them at the beginning of perestroika published in the local newspaper Pavel Ivanovich Negretov, another saved his grandfather from the bottom left after the Amnesty and rehabilitation work in Vorkuta (he got an eighteen year old boy and used to the specific life beyond the Polar circle). Negretovu have to thank for the fact that he was still in Soviet times published in the West book "All roads lead to Vorkuta, in which a separate Chapter devoted to Moses Naumovich Averbakh. Another grandfather translated from French. Basically, the article by Roger garaudy, author of the famous "Realism without shores". The last essay he also translated and handed over the manuscript is deposited in the Institute, it seems, the world literature. I remember in my childhood with great interest read my grandfather's translation of king Hussein of Jordan "My war with Israel." Frank and truthful information about the defeat of Israel in 1967 the joint Syrian-Jordanian-Egyptian-Palestinian forces had no chance of publication in the USSR and went in "Samizdat". Any material interest of his grandfather in her translation, of course, was not just Moses Naumovich could not make a contribution to the information support for the Jewish people. Great respect deserves another aspect of his grandfather - bar. Sakaliskes in the struggle with the NKVD, the grandfather was well versed legally and it is used. He is, after twenty-five years in prisons, camps and references nobody was afraid of nothing and am down in some people's control Commission, actually moonlighting as a lawyer. I still "live" silver sugar bowl. Grandfather gave her mother a young man who was sentenced to fifteen years for murder and whose grandfather saved, achieving reviewing the case and full justification. Moses led the Naumovich and flat, and movable and property cases. Many of the Stalinist prisoners freed in 1954-1955 under the Amnesty, without waiting for the twentieth Congress, and then left with the stigma of conviction. Grandfather for them to pursue full recovery. The word "Amnesty" and "rehabilitation" I have learnt to pronounce in the early pre-school age, despite their obscure and hard-to. 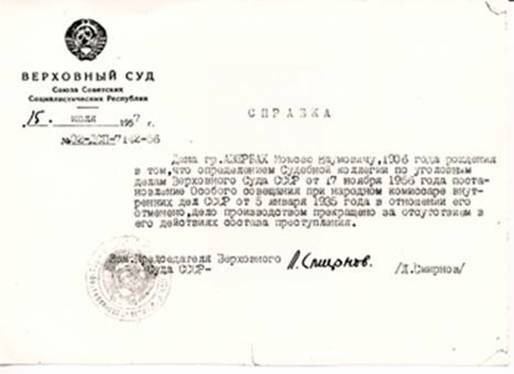 The main task of a lawyer in the Soviet times it was able to write papers, and my grandfather did it brilliantly. It came, however, to the absurd - giving a debt to my parents some money for the purchase of the cooperative, he was a loan agreement by all the rules, a few pages. I stumbled on this masterpiece of jurisprudence, was somewhat shocked. The beginning of the seventies was marked by mass "Exodus" of Jews from the Soviet Union - in order to reduce the intensity of emotions, most willing to open the exit, and the others were quietly "press". And the way to prestigious universities were closed and to work in "good" did not take place... both things took place with some exceptions, but they were few. However, convinced that "the Zionists" and "anti-Soviet" Moses Averbach was an equally staunch patriot of Russia and did not want to leave (at least, in our family this question never even discussed). Perhaps the reason was that no direct pressure from the KGB Stalin campers experienced. Strength was imprisoned in Stalin's time, for ten or twenty years and it is absolutely fearless "old political prisoners" were still a lot, and unless you really need the security services tried not to irritate I think she had a lot more acute problems. However, it was Moses Naumovich lost my job in the "people's control", which gave many rights to protect people. He was there quietly asked" under the pretext - because of advanced age (although he was not yet seventy). Moscow in these years was buzzing like a disturbed hive. About tensions in that time, says such fact: when in 1973 Varlam Tikhonovich Shalamov hoping to join the Union of Writers sent penitential letter in "Literaturnaya Gazeta"newspaper, where a very streamlined wrote that "the problems of Kolyma tales charged by life itself", he, "the apostate", was immediately denied from home Moses Naumovich and, as I understand from other "nice" places. I think that Shalamov was not easy because he was admitted to the Union of Writers. A house of Moses Naumovich held a huge stream of anti-Soviet literature. Grandmother Elena were published in "Samizdat" and further. One former Vorkuta of lagerny, German Selm Selma F. Ruoff, received through the German Embassy mounds "Tamizdat"that is published abroad Newspapers, books and magazines, and also sent further. All this was done that quite clearly, but not very secretive about the KGB could not know, but I prefer them not to bother. I remembered the Kolyma not just - for Moses Naumovich and Elena Alexandrovna these trips were not tourism, but absolutely conscious "visits in the past. And not masochistic, but purely cognitive - as there birch? As there Salekhard? In Krasnoyarsk camps were the same as in Tyumen those women... we Went to them and the Volga river and the white sea canal. However, not only the boat and traveled by train, and even somewhere to fly an airplane, which in those days was rare. Moisey N. and Elena. The end of 1970-ies. Among other things, grandfather, as most prisoners, had a "Golden hands". At home he always worked, and in humble Soviet way of life he always brought some improvements. And how much he did to me toys - not to count! And sawing and grind, and a toy lamp assembled from brass tubes... After the death of Moses Naumovich many years I almost did not buy the tools - my grandfather, they were on all occasions. This was the house of Moses Naumovich - uncle mony - and I was very lucky that the age of six I lived nearby, on Lomonosovsky Prospekt. Go there, as I remember, trolleybus number seven, and grandmother Elena (Baba Lola) picked me up, carried to his area of Gagarin, and brought home the evening before, when the father and mother came home from work. Sometimes I used to sleep there - I was given another cot. At preschool age I was very active and energetic child, and, as expressed Moses Naumovich, after my apartment looked as if "passed Khan Mamay". I should note that my grandfather was with me never "Lisp"fundamentally not played any games, and even more toys. In short, even in early childhood, he treated me as an adult (and it is usually the children very much). Externally Moses Averbach nothing special stood out. At first glance an ordinary elderly Jew. Bald head, the specific shape of the nose, the stature... But it was worth to pay attention to absolutely straight back, always equal the "statement" of the head and eyes dark, a little faded with age eyes to understand that you are dealing with a "man of iron" (was this film Wajda). I don't even know what to compare the sight of his grandfather. Not hard, not dark, not authoritative... Just iron, and all. It was felt that this man will have to defend their principles and will never give up. And most importantly - I am very, very well remember all the things that my grandfather told me and what I was taught (even though "body language" is just a personal example). Perhaps, the main features that I've always tried to learn from Moses Naumovich is unbending character, faithful to its principles, the ability of any age to learn from scratch any subject, and, of course, the life according to the rule "change of practice is the best rest." Could I or not it is "inherit" these traits is not for me to judge. Crooked fence of rotten plywood. And do not sow bread. in the cold ground, as grain. gasping against the cold, screaming about the rest. four kilometers away from the ring tram. Moses Averbach passed away long and hard. I taught him to walk up the stairs as a child, " "straighten", "pull yourself together", "keep right" and so on. I must say that he has for some time been able to overcome the irreversible changes in the brain - he was only a little over seventy. But the years of the camps did the trick. In 1980 there was a second "shot" and a sharp deterioration in his condition - he almost could not walk. We are in the toilet specially screwed to the walls of the pen so that he could for them to stay. And now, apparently, the man many months hopelessly ill - but still can not accept his death as inevitable and close, and she eventually turns to tragedy and surprise. Moses Naumovich it was even more difficult, because he had in 1981 happened third stroke. Not long served "device" - grandfather was completely paralyzed. Moreover, the "disconnected" and no one recognized him. So he lived another year. And Moses died Naumovich quietly. 10 December 1982 grandma this morning I saw that he was not breathing. At the funeral there were many people, though no one in particular did not call - grandmother phoned only relatives and close friends. However, don crematorium came fifty or more. Even at the funeral were twenty or thirty. Naturally, was buried without any priests (Jewish, Orthodox or any other), and grandfather, and grandmother, and my father were convinced atheists. Elena surviving spouse of almost 10 years and died in 1992. In conclusion, I will say only one thing: I was very lucky that my grandfather was Moses Averbach, and my duty to leave to descendants the memory about him and his writings.